This card has been discussed in a few places, but those were mostly thread-jacks, so I thought it deserved it's own thread with compiled discussion. Obviously you can cast this on your own Warlock and try to ensure a friendly demon creature attacks an enemy creature each round. And this can be combined with Demonhide Mask to make your Warlock's own attacks (including attack spells) count to activate Eye of Bael. But an interesting thing about this spell is it isn't Warlock (or Dark Mage) Only. ... I would probably also cast Eye of Baal on my opponent to try and speed up the damage rate. The Mage to whom the equipment is attached controls that equipment. For example, if you cast Sectarus on a friendly Mage, he will be able to attack with Sectarus, and plan curse spells for it. This is different from other spells, such as enchantments and conjurations, in which case control is retained by the caster of the spell. Note that you cannot cast, control, or use equipment which you are restricted from. For example, A Priestess cannot cast, control, or use a Staff of Beasts which is Beastmaster Only. See “Spell Restrictions”. You cannot have 2 pieces of equipment attached which have the same name or the same location. For example, you cannot have 2 Leather Gloves attached (same name). You cannot have both or a Bearskin and a Dragonscale Hauberk attached (same location). If an equipment object of the same name or location is cast upon a Mage, if the spell is friendly controlled, the new equipment object is placed on the Mage, and the duplicate item (the original one which has the same name or location) is removed and placed in its owner’s spellbook. In this manner, friendly Mages can replace equipment on each other with newer or better choices. This might be useful for removing equipment armor which is no longer useful because it is corroded (see “Corrode”). Note that if an enemy-controlled equipment object of the same name or location is cast on a friendly Mage, the new equipment object is destroyed and placed in its owner’s discard pile. Enemies cannot replace equipment items on friendly Mages. 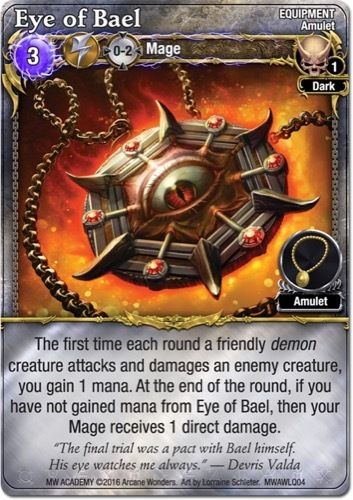 At first I interpreted this to mean that, if your opponent puts an Eye of Bael on you, you can't simply replace it. But on re-reading, it would seem that isn't the case. If an enemy tries to replace your equipment (e.g. replace your Moonglow Amulet with Eye of Bael), the new equipment (EoB) gets destroyed and goes to its owner's discard pile. However, if your opponent put EoB on you first, you "control" it, so you can replace it with your own Moonglow Amulet, causing it to go to its owner's discard pile. At least, I think that's how it works. That said, if your opponent doesn't have an amulet to replace it with, their own option is Dissolve/Crumble (or Explode or Corrosive Orchid), or be stuck with it for the rest of the game, making it a cheap curse to play. Too bad it doesn't have the Curse subtype. Have you had success with Eye of Bael? Thank you for the book idea. If an enemy tries to replace your equipment (e.g. replace your Moonglow Amulet with Eye of Bael), the new equipment (EoB) gets destroyed and goes to its owner's discard pile. However, if your opponent put EoB on you first, you "control" it, so you can replace it with your own Moonglow Amulet, causing it to go to its owner's discard pile. That's exactly how i know it works. But I haven't tried it out yet. 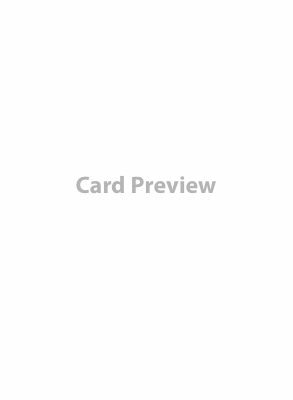 There are dot cards that are more reliable I my opinion. Warlock puts eye on bael on wizard. Wizard casts Moonglow Amulet on self (for just 6 mana). Eye of baels is destroyed. Wizard puts amulet on self. Warlock cannot replace it with eye of bael. Warlock puts eye of bael on wizard. Wizard casts Moonglow Amulet on self. Warlock Crumbles Explodes Moonglow Amulet, then casts Eye of Bael on Wizard during final QC phase. Wizard takes a damage during upkeep, doesn't have any more Amulets, and cries (before having to Dissolve the EoB next round, 'cause Wizards). Yes, it's only 1 damage per round, and is cheap to Dissolve. But it's fun and unexpected. It can also be deployed by Battle Forge (for the LOLz). Upon first reading, I thought that having an enemy EoB on your Wizard couldn't be replaced by the Wizard unless Dissolved/Crumbled first... which would make it much more awesome. And if you could replace someone's beneficial Amulet with EoB (without penalty), that might be broken (e.g. cheaper than Dissolve and forces them to recast over and over). I could also see this being broken if you could replace someone's Regrowth Belt with Leather Belt, or Champion's Gauntlets with Leather Gloves. But yes, a simple Amulet replacement costs nothing and ends up being a waste for the Warlock if he prematurely puts EoB on the enemy, so it only works if/when you don't think the opposing (non-Warlock) mage has any Amulets left in their book. Still, at 1 sbp and 3 mana in the final QC phase, it's a cheap trick for a DoT strategy. Warlock puts Eye of Beal on Wizard. Wizard summons a bunch of demons. *Slow clap* "Well played, sir. Well played." those mage cries comments are very funny.